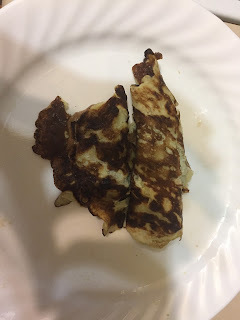 A new take on the December 18 no flour pancake recipe same ingredients different method. See the end of the blog post for the new recipe. Sorry I haven't been able to keep up with blog posts. I decided to return to school to learn web development at Red Academy while still working at the schedule has been really gruelling. 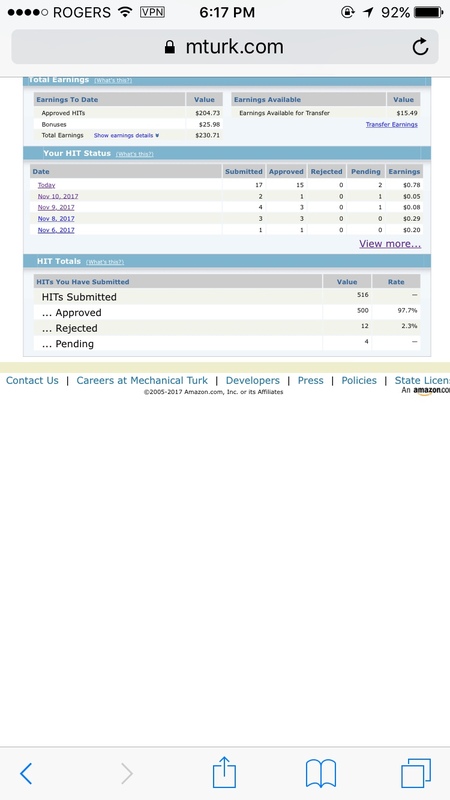 Changes to my life to come soon. The course has been amazing but super fast paced I am actually amazed at how much I learned in the last two weeks and that I didn't pass out from exhaustion with very little sleep. I am doing the beachbody challenge which involves three work-outs a week and 5 shakeology's a week and that's what I attribute to not getting sick on only 10 hours of sleep during the whole week. Last week I had a business dinner meeting at Cardero's in Vancouver but I didn't get any pictures. I haven't been there in year's as it is known for its seafood and in the past I felt their vegetarian options were lacking. This time there were a few vegetarian items on the menu. I had a really good salad as an entree it had everything I would have wanted in it potatoes, beets, olives just a few of the items in it. The people that ate seafood enjoyed it and the place is known for its view being right on the water except it was in the evening so I couldn't see much. Everything was excellent. I also stayed the night at the Ramada limited in downtown. I was a little hesitant as it was convenient and cheap but the hotel was excellent. The staff was the best they called when I got to the room to make sure everything was okay. The room was great except not being able to see out of the window but the window did open slightly. My water also got stuck in the vending machine and the staff was very nice to make sure I received it when I returned from dinner. Breakfast was included but it was really limited okay for the price nothing great. This is a great hotel if you are going to be in downtown for a show and don't want to commute home well worth the price. If you haven't seen my December 18 no flour pancake posts go read that one now. I saw a food network add that was a very similar recipe same ingredients except the almond butter isn't mixed into the batter. I don't know if the magazine is copying food network or food-network is coping the magazine either way I am sure the slight variation of the recipe is keeping them out of legal trouble. 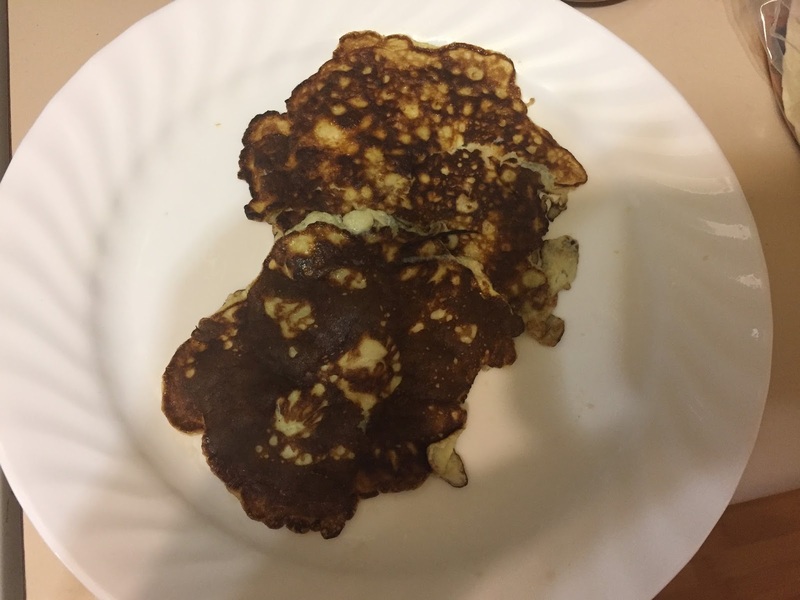 Of course I can eat this every day so I had to try out the recipe. 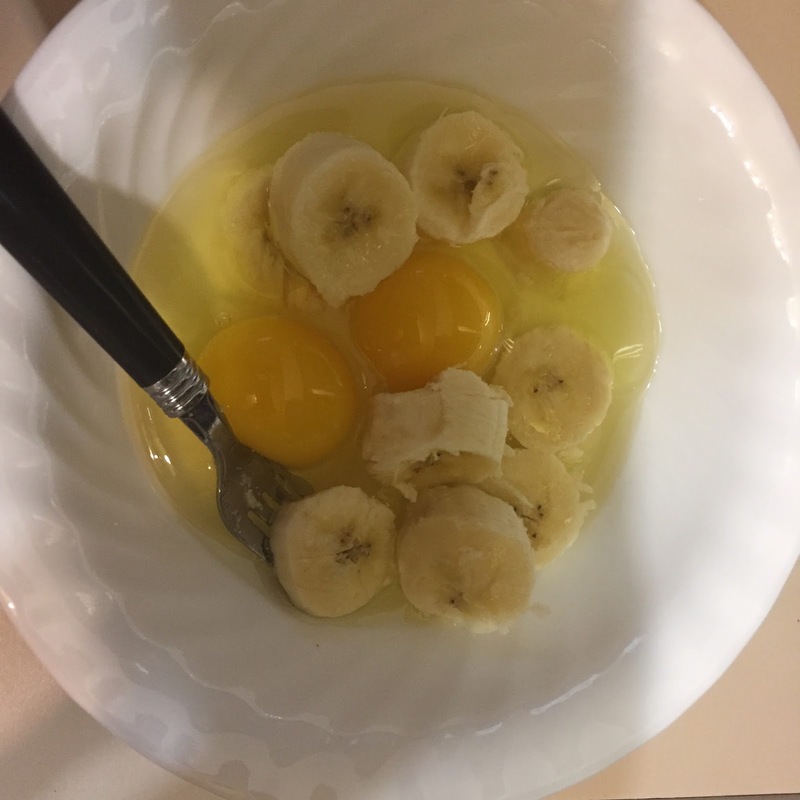 Mash the banana and whisk the egg into the batter and cook like a pancake. 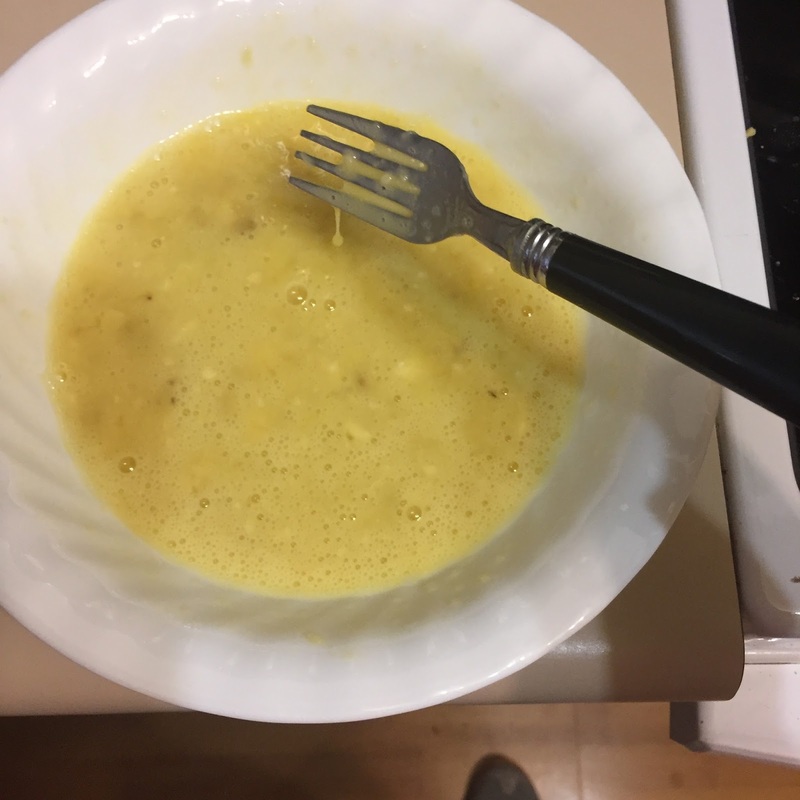 My magic bullet was in the dishwasher so I just used a fork to mash this time. Once the pancake is cooked spread almond butter and roll. 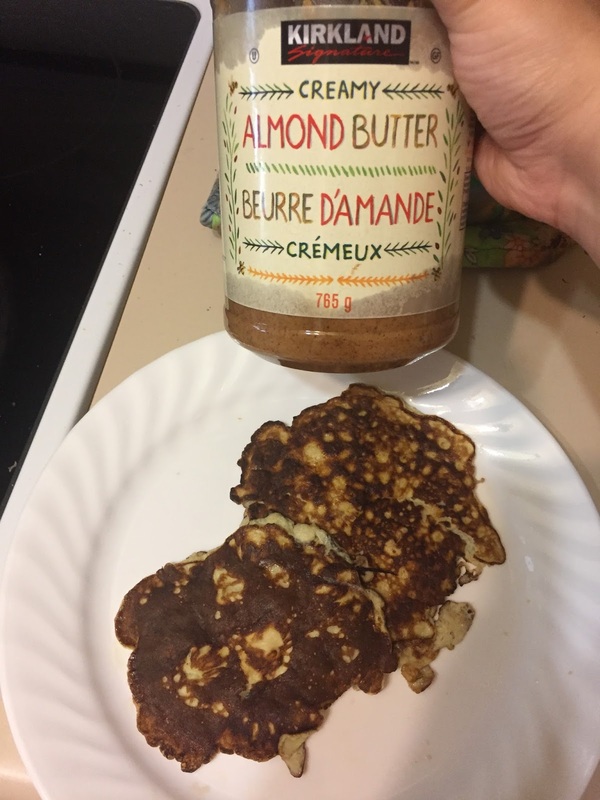 I personally liked the first version better where the Almond butter is mixed into to the pancake part. I felt it gave it a better texture. I did find the two ingredient version less sweet and because its plain other toppings could be rolled in. I will probably rotate between the two different methods in the future. Let me know in the comments if there are any vegetarian recipes you want me to try making.